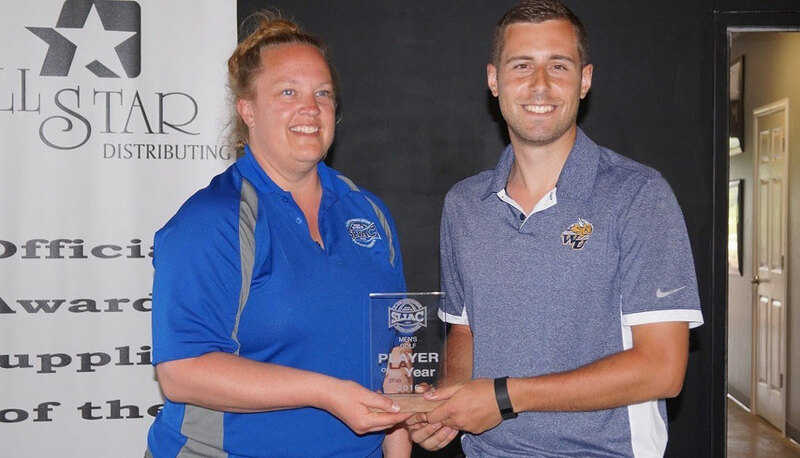 Webster University senior Tyler Thorman nabbed first place in the St. Louis Intercollegiate Athletic Conference (SLIAC) golf tournament held on April 18-19 at Aberdeen Golf Club in Eureka, Missouri, taking home the 2016 Player of the Year award. SLIAC First Team All-Conference honors went to Thorman and teammates Jon Hughes and Max Ernst, with Justin Onken and Will Murphy earning SLIAC Second Team All-Conference honors. Ernst was also named the 2016 SLIAC Newcomer of the Year. Thorman started the day in third place, two strokes behind leader Michael Vick from Spalding University. However, Thorman quickly showed he was capable of making a run early on when he birdied the opening hole. Thorman also showed resolve early on, fighting back from a bogey on hole four. Thorman had a birdie on six and took the lead on the seventh when he eagled the 530-yard hole. After a tee shot down the left side of the fairway Thorman put his second shot on the green, landing it blindly beyond a hill with the ball rolling just inches away from the cup. Thorman then birdied number eight and carried a 33 on his care into the back nine. Webster University golf's Tyler Thorman was awarded SLIAC 2016 Player of the Year. On a day of ups and downs, Thorman would soon lose his lead as he bogeyed the first three holes of the back nine. That allowed Spalding's Michael Vick to grab the lead once again. Vick, who led each of the first two rounds, held steady on holes 12-16 and then birdied number 17 to take a one stroke lead into the final tee box. With Thorman and Vick paired together in the final group, the crowd patiently awaited their final approach on 18. Thorman ripped his tee shot down the middle and then calmly landed his second shot on the green. From there, Thorman two putted for a par, leaving Vick with a putt for the win. Vick however hit his par putt left, tapping in for a bogey and sending the two players to a playoff. The duo retraced their steps back to the tee box on 18 where both players hit their drives into the water. With no harm done, Vick played his ball up the left side while Thorman went to the right of the green. Thorman was the first to reach the green, hitting off the cart path and landing the ball within 10 feet of the hole. Vick reached the green on his next shot and it would come down to a putting contest for the 2016 SLIAC Individual Title. Thorman ended up putting in for championship as his teammates cheered him on. Webster finished second in the tournament with an 895, four strokes behind winner Spalding.